Starting any new weight loss program brings with it tremendous fear of what I call the two diet predators – hunger and cravings. These two predators destroy weight loss attempts for millions of people every year. I know them well. They have ruined my weight loss attempts on many occasions. 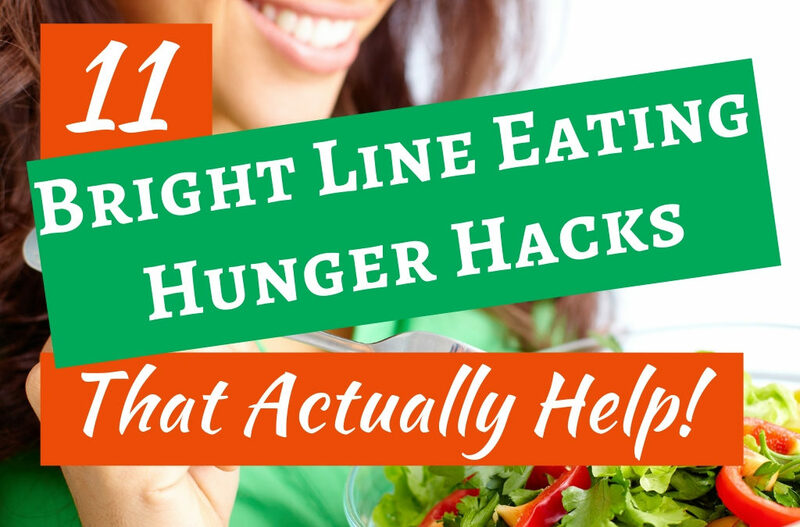 In this post were going to take a look at eleven Bright Line Eating specific hunger hacks that you can use to defend against hunger. (We’ll saving cravings for another day). If you are new to Bright Line Eating or considering giving it a try, then you may be worried about how to deal with hunger during the weight loss phase. That was certainly one of my biggest fears. After all, in spite of what you may see on late-night infomercials, hunger is a natural response to weight loss. In fact, the more pounds you shed, the more your body and brain may fight against your weight loss. For example, research shows that as you lose weight your body produces increased amounts of the hunger hormone ghrelin. Ghrelin is your brain’s way of encouraging your body to eat more calories so you don’t die of starvation. This is one of the reasons that hunger can get worse as you lose weight. And why so many of us jump ship after just a short time into our new attempts at dietary change. If this has been your experience, you are not alone. One of the things I really liked about Susan Peirce Thompson’s book, Bright Line Eating, was that she didn’t make false promises about never feeling hungry. Although some people never struggle with hunger on Bright Line Eating, she clearly acknowledged that others will struggle with hunger for a bit. I was certainly one of those people. In fact, I struggled with hunger for about 90 days. To be sure, that is much longer than most people, but it is not unheard of. However, the book and the boot camp prepared me for this possibility and walked me through what to do about it. The hunger hacks I’m sharing with you now are how I managed to keep my bright lines even while struggling with bouts of significant hunger. Some of these hunger hacks are straight out of the Bright Line Eating program and others are things I’ve pieced together from various sources and/or adapted through some practice. To the extent possible, establish a consistent mealtimes for breakfast, lunch and dinner. You may have to tweak these a bit at the beginning to see what works best for you, but settle into a consistent pattern as soon as possible. At my office, I blocked off my schedule every day from noon to 12:30 so that my staff wouldn’t schedule any client appointments for me during that time. Without consistent meal times my hunger levels would become very hard to manage. If I ate a meal earlier because I was hungry, then my hunger would be almost unbearable by the time the next meal rolled around. And if my schedule forced me to eat later than normal, my meal size was much less satisfying because I was so hungry when I sat down to eat it. And consistent meal times will also provide a long term benefit. By eating at the same time every day, you are training your body to not expect food between meals. I have found that with fairly consistent meal times, I am generally not overly hungry between meal times. There will always be some days where you’re just unusually hungry, but this is fairly uncommon. Most days I first notice being hungry 60 to 90 minutes before meal time and I am appropriately hungry just before its time to eat. One of the hunger hacks I used when I first started the Bright Line Eating was to do everything I could to make my meals look plentiful. The first thing I did was to replace all of our large plates with smaller, red salad plates. There is scientific evidence to suggest that plate size can help with weight loss because it can lead to reduced consumption. But, none of this research was done in a situation where portion sizes were literally being weighed by the consumers of the food. 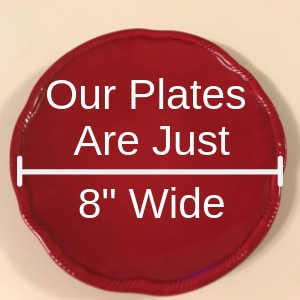 However, I figured that the plate strategy must work because it makes you think you’re eating more food than you really are (or at least a large plate makes you think you’re eating less than you really are). So I thought eating off of a smaller plate may help me feel like I’m eating more food than if I used our traditionally sized dinner plates. And I hoped that if my brain thought I was eating more food, then I would be a little less hungry between meals. Admittedly, this is anecdotal evidence, but I do believe that it helped. And there is scientific evidence to suggest that the ability of a meal to help control our appetite can be influenced by how much we think the meal will be able to control our appetite (Chambers, McCrickerd, & Yeomans, 2014). So to this day we still serve meals on our smaller plates. It helps me feel like I’m eating a good amount of food. And we like that the smaller plates are a bit easier to clean and they take up less space in the dishwasher. The other thing I often did at the beginning was to take a moment at every meal to appreciation my portion size. I would take all of the food that I was about to eat and display it in front of me. I would then pray and thank God for my food and acknowledge that what I was about to eat was healthy and sufficient enough to get me through to my next meal. This was most helpful at work where I would typically just grab one thing at a time from my lunch bag, eat it, and then reach in for the next item. Instead I’d pull it all out at once and display it all before I ate any of it. And this may strike some as a bit silly, but I found this little ritual to be quite helpful. In fact, I still like to do this at most of my meals to this day. If you’ve done a variety of weight loss programs in the past, you’ve no doubt been told to eat more protein to help fight hunger. And, indeed, the scientific research supports the idea that protein helps reduce hunger. But how does that translate into Bright Line Eating where your protein servings are pretty much predetermined? Well, the hunger hack for Bright Line Eating is to eat higher protein protein. In other words, focus on the foods that give you the most grams of protein per serving (usually four ounces for woman and six ounces for men during the weight loss phase). The news here is best for meat eaters. For a typical Bright Line Eating protein serving, meat is often going to provide you twice the grams of actual protein than many plant based options. And chicken will give you the biggest bang for your buck. 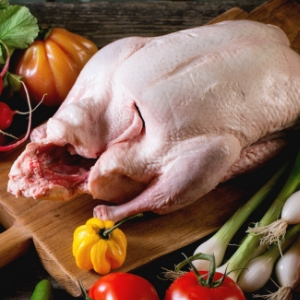 A four ounce boneless, skinless chicken breast has 35 grams of protein. Beef is a close second. 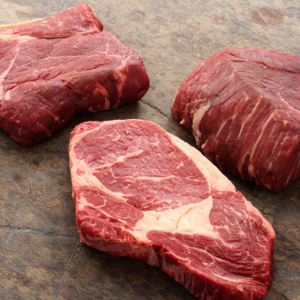 A four ounce steak will give you about 34 grams. 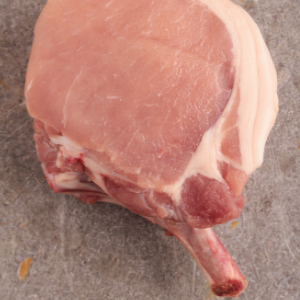 And a four ounce pork tenderloin has 30 grams. Other good sources of protein are tuna (29 grams per four ounce serving), parmesan cheese (20 grams per two ounce serving) and eggs (12 grams for two eggs). If you’re a vegan, some of your highest protein options will be nuts, tofu and lentils. Peanuts and tofu will be your highest protein options at 14 grams per Bright Line Eating serving for peanutes (two ounces) and 29 grams per serving for tofu (6 ounces). Almonds are also a good option at 12 grams of protein per two ounce serving. And six ounces of cooked lentils will net you 15 grams. One of my favorite hunger hacks when I first started Bright Line Eating was to drink a can of flavored sparkling water with lunch and dinner. Research shows that carbonated water will help you feel fuller than regular water and this has certainly been my experience. A nice can of La Croix or generic equivalent was just the thing to help my stomach feel full right after eating. One of the hunger hacks used by many in the Bright Line Eating community is brushing your teeth. If you’re hungry between meals, try stopping what you are doing and brush your teeth. This may signal to your brain that meal time is over and it is not time to eat. This probably works best for those of us who tend to brush our teeth after meal time. If you brush your teeth just after you wake up and before breakfast, then you may find that brushing your teeth makes you more hungry. There is no hard research on this topic, but this Popular Science article discusses some theories. If you are the type of person who can sleep well if given the time, then get a good night’s rest whenever possible. Research suggests a strong connection between sleep deprivation and weight gain. When you are sleep deprived your body will often seek out high calorie foods as a source of energy. And sleep can negatively affect some of the hormones that help regular hunger. Unfortunately, some of us struggle with sleep even when we do go to bed at an appropriate time. I personally have struggled with insomnia for several years. More days than not, I struggle with some level of sleep deprivation and some of those days are quite difficult. So telling me to get more sleep can be frustrating advice. If you do struggle with sleep, the good news is that you can still successfully lose weight. And the structure provided by Bright Line Eating may be even more helpful to you than for others. Sleep has been a challenge for me during my entire Bright Line Eating experience. But I still managed to lose over 150 pounds because I was not relying on willpower to get me through. While all high fiber foods are thought to help reduce hunger, apparently the research doesn’t necessarily support this broad claim. Apparently, the source and/or type of fiber can make a difference when it comes to fighting hunger. 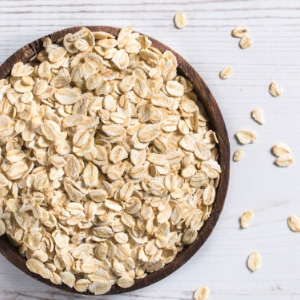 But oatmeal has specifically been shown to reduce hunger. I’ve had a bowl of oatmeal almost every morning since starting Bright Line Eating. This has been a great hunger hack for me as it helps keeps me well satisfied through most of the morning. Milk is an acceptable beverage for Bright Line Eating if you use it as your protein. However, an eight ounce glass of milk only contains about 8 grams of protein which is far less than many of the proteins previously discussed. And the research shows that liquids are not as good as solids at reducing hunger. So skip the milk and opt for something that requires chewing and with a higher amount of protein. A systematic review of a variety of studies focused on water consumption and weight loss concluded that, for individuals who were dieting for weight loss, there was indeed a “weight reducing effect of increased water-consumption” (Muckelbauer, Sarganas, Grüneis, & Müller-Nordhorn, 2013). Presumably this should hold true for any approved, zero calorie Bright Line Eating beverages. Need some inspiration? Check out my post on 17 Specific Bright Line Eating Drink Ideas. I know that this is a bit ironic since sticking to your bright lines is why you are hungry in the first place. But in the long run, eliminating sugar and flour from your diet is the ultimate hunger hack. No quick fixes or short-term only solutions here. Bright Line Eating is specifically designed to rewire your brain so that you change your relationship with food and irresistible hunger and cravings become a thing of the past. Hunger doesn’t have to do you in. By following these hacks and sticking to your bright lines hunger will eventually shift from a state of being to a properly working signal that lets you know it is actually time to eat.